Saint John of Kronstadt (1829-1908) is one of the most beloved Russian saints to whom thousands would come seeking his ascetic and pastoral advice. He served most of his life as a priest at St Alexander Nevsky’s Cathedral in Kronstadt outside St Petersburg. He wrote widely on many topics, especially on the profound existential need to cultivate transcendent Christian love and forgiveness. Perhaps you had the opportunity to see Tina Kandelaki’s television feature on war hero Irena Sendler. For those who missed it, Irena was a Polish/German woman who at the start of the war knew the German’s plans for exterminating Jews in Poland and so she sought and received work in Warsaw, the city of her birth. The Germans invaded Poland in 1939 and she began rescuing Jews by creating false documents to help Jewish families escape the Ghetto. “It is always possible to make a new start by means of repentance. ‘You fell’, it is written, ‘now arise’ (c.f. Proverbs 24:16). And if you fall again, then rise again, without despairing at all of your salvation, no matter what happens. So long as you do not surrender yourself willingly to the enemy, your patient endurance, combined with self-reproach, will suffice for your salvation. ‘For at one time we ourselves went astray in our folly and disobedience’, says St. Paul. ‘. . . Yet He saved us, not because of any good things we had done, but in His mercy.’ (Titus 3:3,5). So do not despair in any way, ignoring God’s help, for He can do whatever He wishes. On the contrary, place your hope in Him and He will do one of these things, either through trials and temptations, or in some other way which He alone knows. He will bring about your restoration; or He will accept your patient endurance and humility in the place of works; or because of your hope He will act lovingly towards you in some other way of which you are not aware, and so He will save your shackled soul. 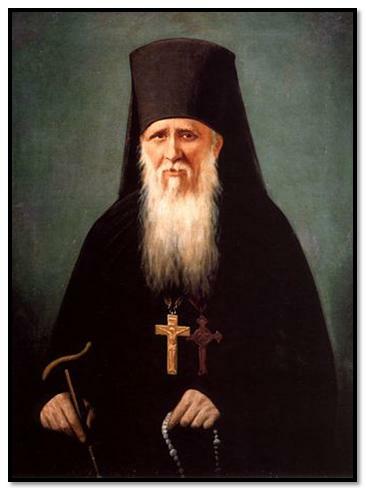 -St. Ambrose of Optina (lived 1812-1891) was a clairvoyant Russian monk and staretz (elder) whom thousands of pilgrims came to for pastoral and spiritual advice. Beginning in 1860, he served as the igumen, or spiritual superior, of the renowned Optina Monastery for over thirty years until his death. In 1884 he founded the Shamordino convent, where he pursued a policy of allowing all women to stay who sought spiritual discernment and refuge at the monastery, even the blind and the deaf. He was named in honor of St Ambrose, (lived c. 330-397), venerated by both East and West, a fourth century Doctor of the Church and archbishop of Milan. He profoundly inspired Fyodor Dostoevsky, whose character Fr. Zossima in “Brothers Karamazov” is based off the monk. 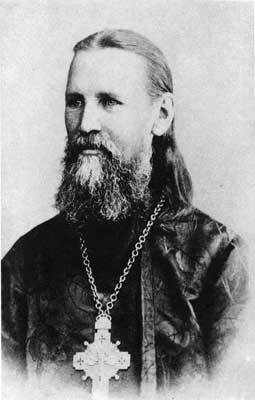 Saint John of Kronstadt (1829-1908) is one of the most beloved Russian saints to whom thousands would come seeking his ascetic and pastoral advice. He served most of his life at St Alexander Nevsky’s Cathedral in Kronstadt outside St Petersburg. He wrote widely on many topics, especially on the profound existential need to cultivate transcendent Christian love and forgiveness. “What then is meant by the worship of God? It means that we have nothing extraneous in our intellect when we are praying to Him: neither sensual pleasures as we bless Him, nor malice as we sing His praises, nor hatred as we exalt Him, nor jealousy to hinder us as we speak to Him and call Him to mind. For all these things are full of darkness; they are a wall imprisoning our wretched soul, and if the soul has them in itself it cannot worship God with purity. They obstruct its ascent and prevent it from meeting God; they hinder it from blessing Him inwardly and praying to Him with sweetness of heart, and so receiving His illumination.